We don’t know when the NBA lockout will end, but when it does, you can bet the Pistons will be talking quickly with restricted free agents Rodney Stuckey and Jonas Jerebko. It’s easy to envision a long, bright future for Jerebko. 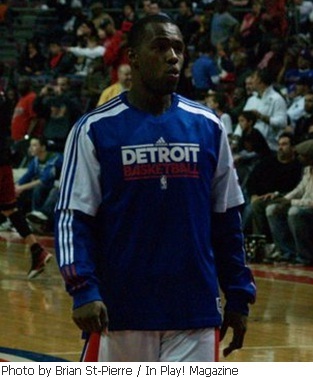 Despite being injured and missing all of last season, he remains a fan favorite and heavily-marketed Piston. The people of Sweden adore him, and as a versatile combo-forward, Jerebko easily fits into the rotation. Stuckey, on the other hand, is a different story. Though he’s still young and improving as a scorer and ball-handler, he’s failed to establish himself as the Pistons’ point guard. In fact, he’s struggled to prove he can even handle playing the position. It’s because of this that the team opted to draft point guard Brandon Knight this summer. With Knight and Will Bynum both expected to earn minutes at the point, Stuckey’s future could be at shooting guard. Unfortunately, he has to prove he can handle playing that position as well. Stuckey’s outside shot still needs work, and he’ll need to improve defensively if he’s going to check the Kobe Bryants and Dwayne Wades of the NBA every night. Most importantly, Stuckey finally needs to do what he’s said he would since the day Detroit traded Chauncey Billups – take control of the locker room. Instead, Stuckey has followed in the footsteps of disgruntled veteran teammate Rip Hamilton, publicly ignoring or cussing at coaches. Yet, he’s failed to take control of the team on the floor or in the huddle the way Pistons fans were used to seeing from Billups. If the team decides that Knight is the franchise point guard, Stuckey will have to compete for minutes at shooting guard with Hamilton and Ben Gordon. If Detroit finds a way to trade Hamilton, that still leaves a four-guard rotation with Knight, Gordon and Bynum. Joe Dumars, Pistons President, still says he plans on keeping both Stuckey and Jerebko around long-term. Because each player believes he’s about to sign a lucrative contract, neither of them are expected to play anywhere during the lockout and risk getting injured. On the other hand, Detroit second-round pick Kyle Singler is set to play in Spain until the lockout ends, and former Piston DaJuan Summers signed a two-year deal to play in Italy earlier this summer. Current veterans Greg Monroe, Charlie Villanueva, Austin Daye and Bynum have all expressed interest in playing during the lockout but have yet to sign anywhere. If Stuckey and Jerebko both return, they’ll be playing for Lawrence Frank, Pistons Head Coach. In all likelihood, Dumars believes that Frank will have an easier and more effective way of communicating with his players than Detroit’s last two coaches did. Frank could have what it takes to get the best out of them, particularly Stuckey. It’s likely that Frank is spending his days at the Palace practice facility studying tape and determining where each of his players best fits in the rotation. With nine players currently under contract and three rookies set to join them, the Pistons roster would be at 14 out of a possible 15 after adding Stuckey and Jerebko back. If Frank assumes both free agents will return, he can already begin planning his lineups based around those 14 players. Dumars wouldn’t be able to make many other additions unless it was via trade. Should the Pistons bring Stuckey and Jerebko back, they’ll need to clearly define each of their roles. Both Dumars and Frank will be required to work closely and carefully to balance out the rotation and put each player in the best positions for them to be successful on the floor.